Port Elizabeth sometimes has the tendency to produce four seasons in one day. A week ago we had a nice hot autumn day that makes one think that we're still in the midst of summer. 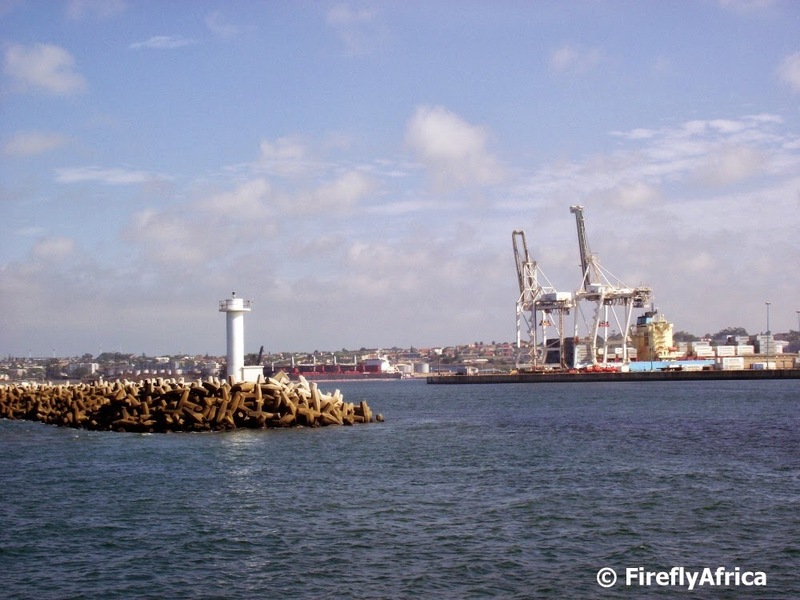 During the afternoon the Damselfly and I went on a cruise in Algoa Bay on the Jester and suddenly the weather changed. Mist and clouds started rolling in from the west without warning and as we cruised back into the harbor the drops started falling. 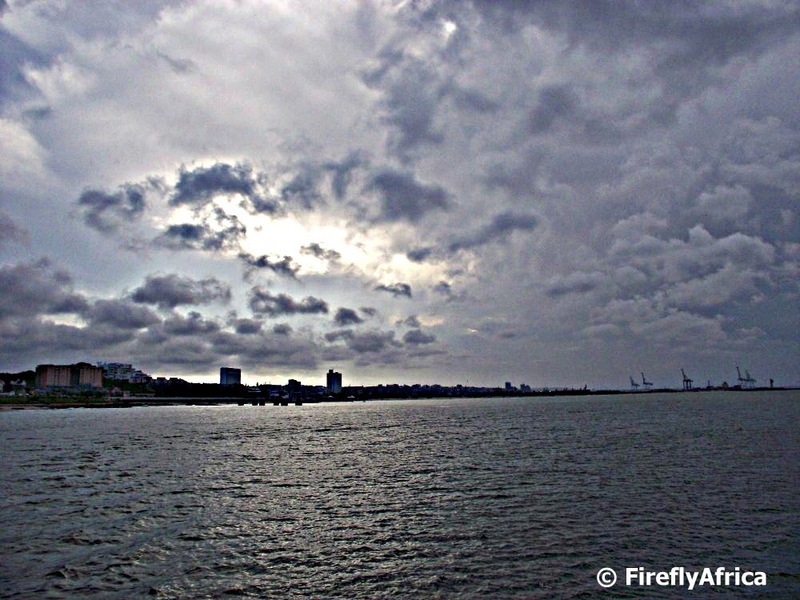 This pic was snapped just out from Hobie Beach as the clouds started gathering. I added just a smidgen of HDR to enhance the effect. 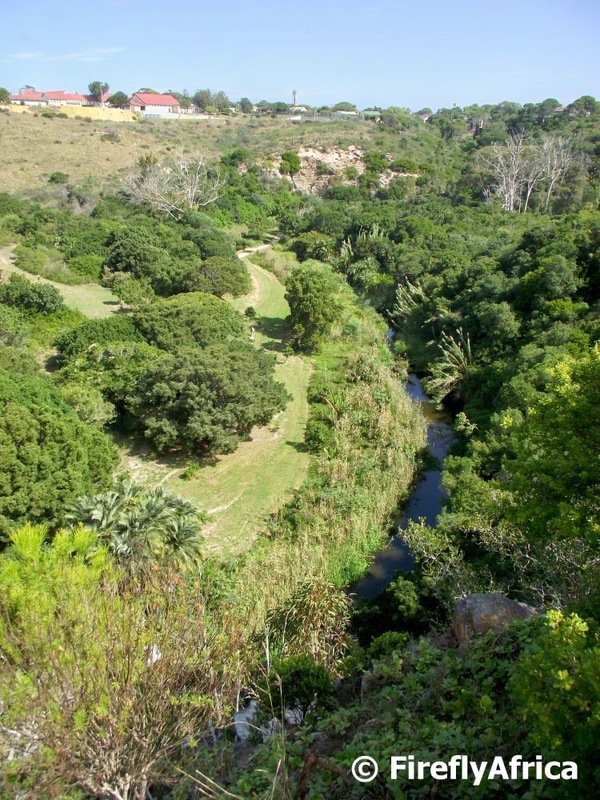 The view of Settlers Park with the Baakens River flowing through it from the How Avenue parking area of the park stays one of my favorite views in Port Elizabeth. A group of giraffes is called a journey of giraffes. 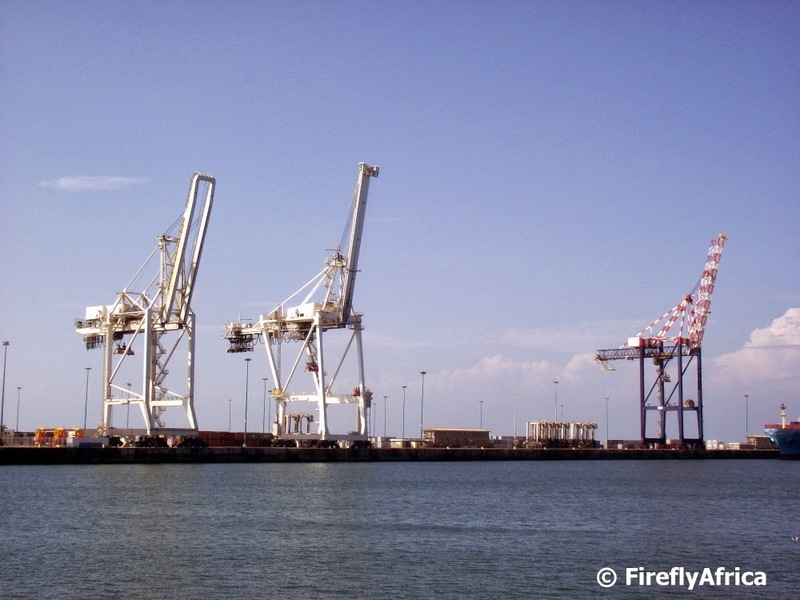 I wonder if you would call these a journey of harbour giraffes? 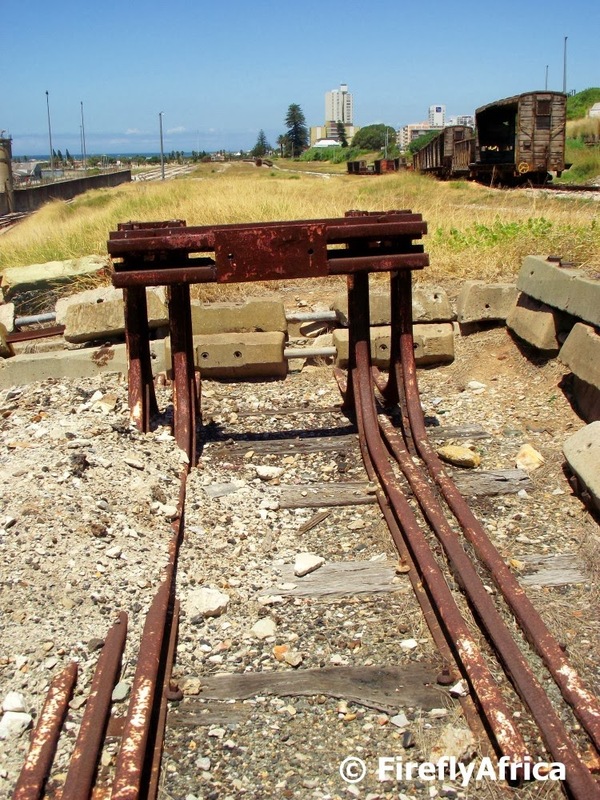 There are two way to walk up the Donkin Reserve from Chapal Street. The first is along the winding Voting Queue path and the second is straight up along the Mosaic Stairs. The Mosaic Stairs is a collaborative work by a group of mosaic artists and is an experiential journey that starts in the darkness and turbulence of the past (dark colours at the bottom) and progresses up to a new dawn and explosion (reds, oranges and yellows) of colours. The steps follow basically the same way that the old steps up the Donkin from the Opera House said used to follow. 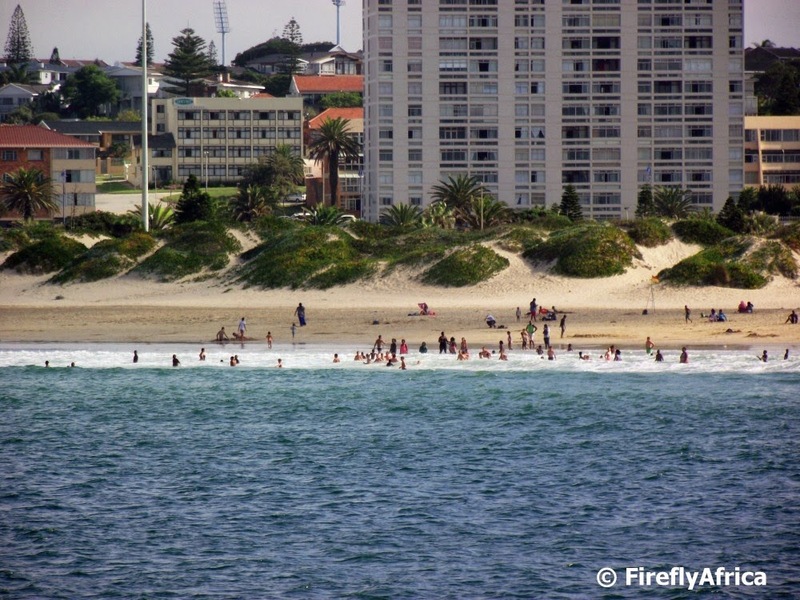 I don't get to go on the sea that often so cruising along the beachfront on The Jester gives one the opportunity to experience a different view of the beautiful Port Elizabeth beachfront. And it really is beautiful. One of the things that does come across as a little weird though is watching people swimming on the beach side and not with the ocean behind them like one usually see. The untitled sculpture by Anton Momberg on the Donkin Reserve takes the form of a female figure without any distinct features and clothing. This leaves her neutral and open for conversation and interpretation rather than being a conceptionally specific piece. 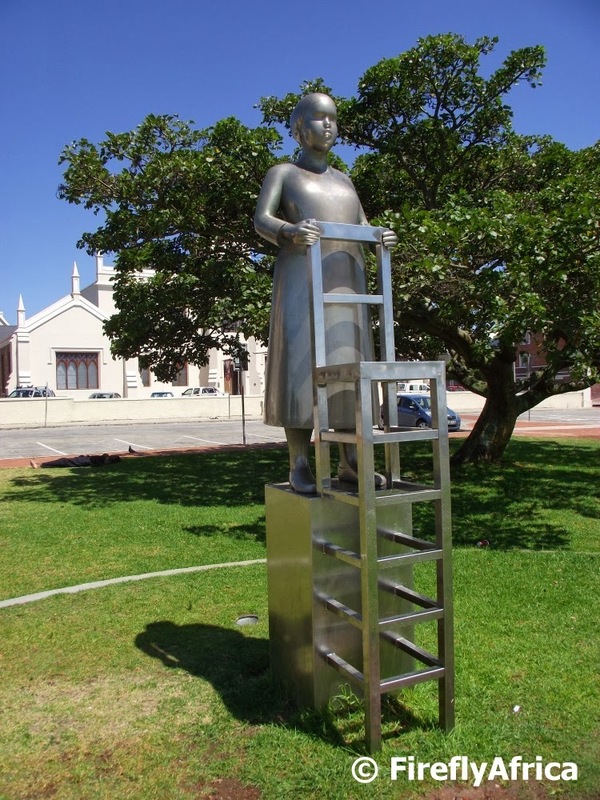 To me it also represents the women of Nelson Mandela Bay right from the early Khoi women who mined salt at Bethelsdorp, the Settler women who arrived on ships with their families in 1820 and Xhosa women who's men fought in the Frontier Wars to modern business women, domestic workers in the kitchens, mothers, sisters and daughters. About three years ago I dug up the info below on the Algoa Bay Bell Buoy and created a post to keep it in until I get a picture of the buoy. The problem is that the Bell Buoy is about 2,5 kilometers out to sea and its not like I'm just going to just strap my camera to my back and take a swim out there. Cruising along the beachfront on The Jester last night we had perfect weather and they sailed around the Bell Buoy before heading back towards the harbor. I could barely contain my excitement at being able to finally snap a pic for the post. In 1797 Lt William McPherson Rice charted a submerged reef approximately 1½ nautical miles off shore, north of Cape Recife. He named it Dispatch Rock and noted that it lies only 3m below the surface at low tide. This rock was a peril to many a ship and in 1838 a lit marker buoy was anchored over the reef, but it was soon washed away. In 1843 another buoy was placed and an official notification was placed in then Government Gazette naming it Roman Rock. Today an East Cardinal marker buoy warns ships to pass on the eastern side. At night a flashing light marks the location of the reef. 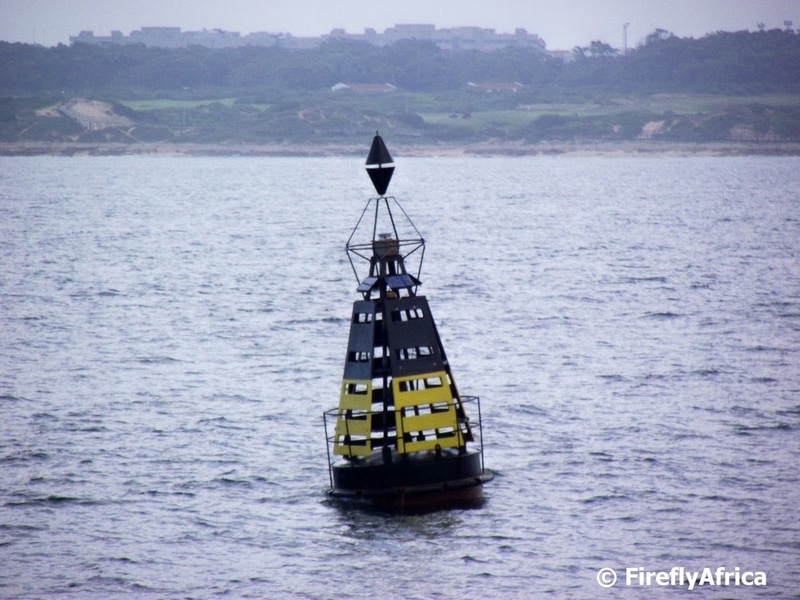 There is of course a bell on this buoy to warn ships when fog rolls into Algoa Bay, hence the name Bell Buoy. This reef is known as Roman Rocks due to the large number of red roman fish that are found here. The extensive reef is made up of gullies and pinnacles and is teeming with fish, soft corals, feather stars, starfish, sea fans and anemones. 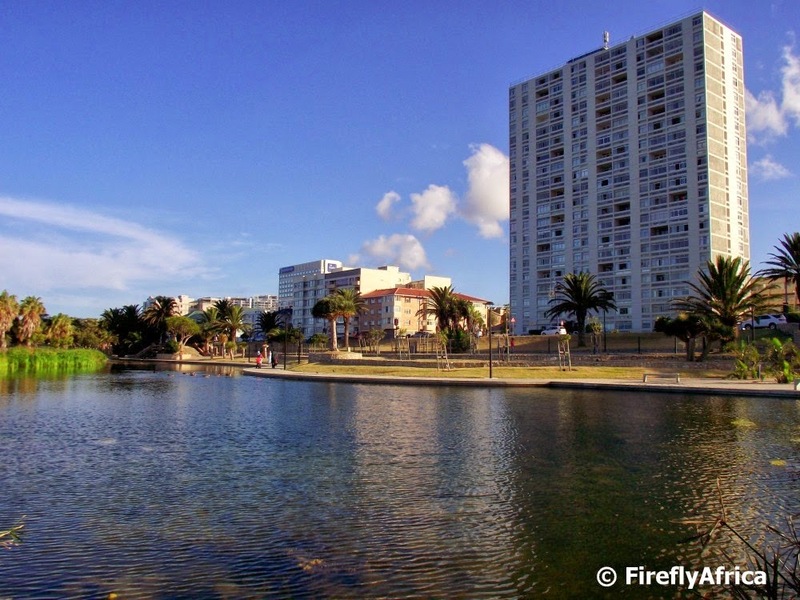 It's a very popular dive site amongst scuba divers due to its close proximity to Hobie Beach. Bell Buoy is also the turning point of the Nelson Mandela Bay Bell Buoy Challenge, a 5 km (and one of the toughest in the world) ocean swim. 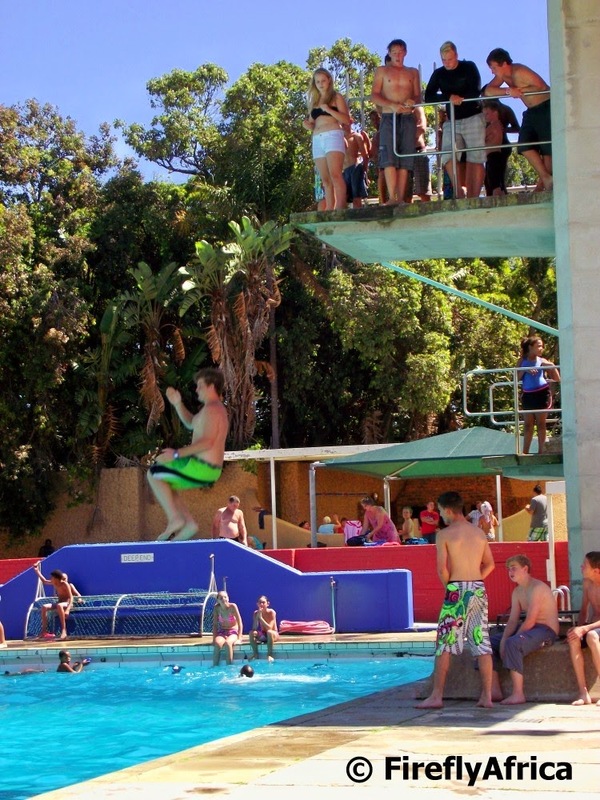 A highlight of visiting the St Georges Park swimming pool is jumping off the high dive and making bombies. The girl n the white shorts and black bikini top probably took a good 15 minutes to gather enough confidence before jumping off that day. It was alarming though to watch the boys trying to show off and get as close to the side of the pool as possible and apparently later that afternoon one of them hit the edge and landed up in ICU. Hope steps get taken to avoid incedents like that in future. 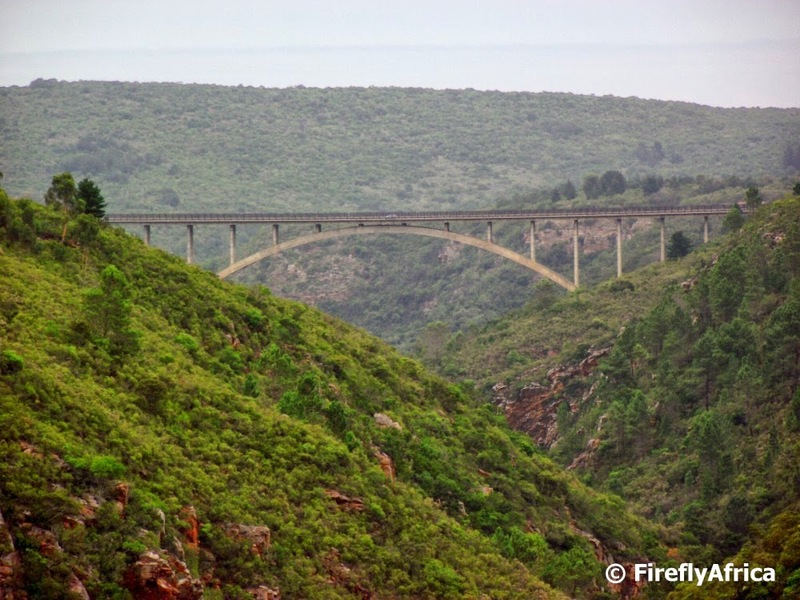 Most people driving along the N2 over the Van Stadens Bridge west of Port Elizabeth have seen the Van Stadens Railway Bridge (the higherst narrow gauge railway bridge in the world) higher up in the gorge in the distance. On a geocaching outing the other day I visited the railway bridge for the first time in ages and got to take a picture of what the Van Stadens Bridge looks like from the railway bridge's side. 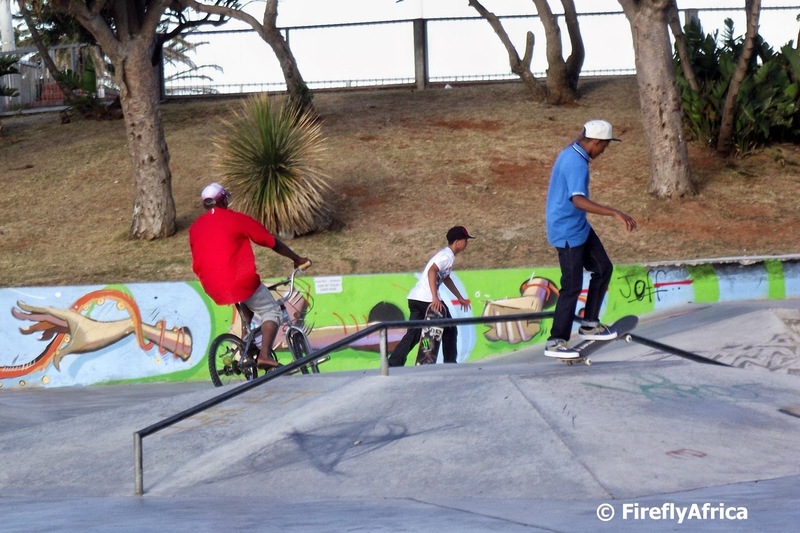 Chilleks Place in Walmer Township won the Nando's Shisa Nyama Championship in October last year with some exceptional braai'ing and flavouring. 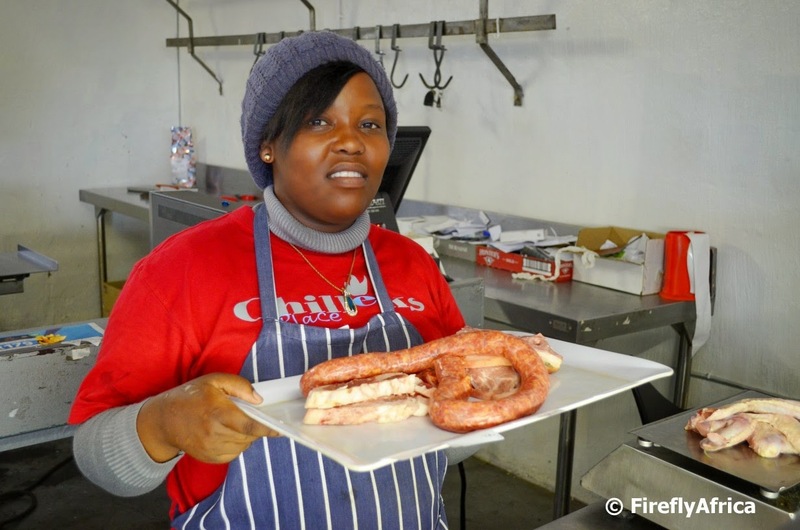 It's maybe not as well known as the big Shisa Nyamas in Cape Town or Soweto, but the quality of their braai is right up there. Before manager Coach and braai master Scott or any braaiers braai your meat, you actually get to choose it from the butchery on the premises (unless you order one of their mouth watering baskets). In the butchery Pabalwa and Siphosethu will help you select your meat, chicken and wors and while its being braai'd you can head next door and order a quarts beer so long to wash it down with. I was having a look at this picture wondering what I should post with it. Straight forward it shows the lake which is part of the Kings Beach redevelopment with The Beaches apartment building in the background. But does that make it the beach lake at the Beaches or the Beaches at the beach with a lake or the lake at the Beaches on the beach? The St Georges Park swimming pool has been a favorite with young and old for like forever. We haven't been to the pool for ages as we have a small pool at home, but a week or so ago Drama Princess had to practice her swimming for school and we decided to go for an hour or so. 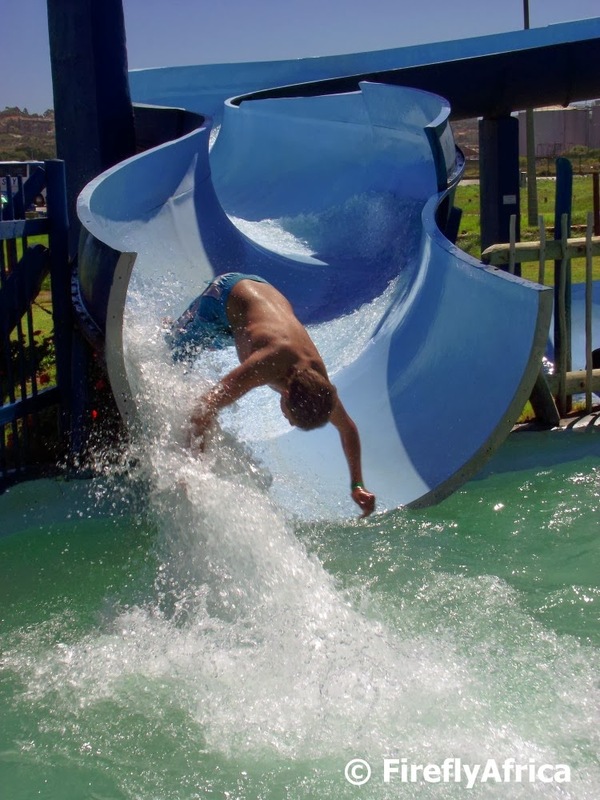 Entrance to the pool is cheap at R8 an adult and R3 a child and the facility was being thoroughly utilized. Good to see that its in a good shape and not struggling like the Newton Park pool. 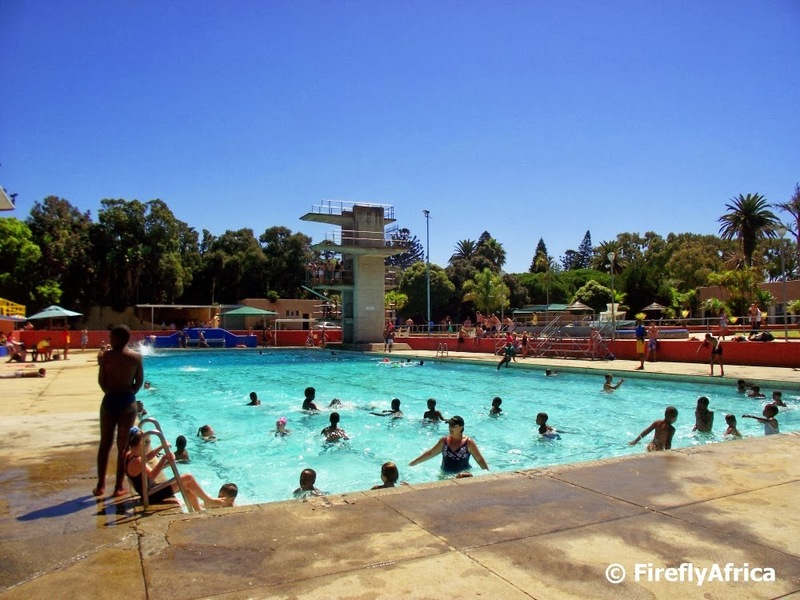 Now if the city would just make a plan with Mrs Fugard's coffee shop in front of the pool and resurrect it in some way to celebrate Athol Fugard's link to the city and that particular coffee shop through his play Master Harold and the Boys. I wanted to make this Monday post a bit of a light hearted one to start the week off on a happy note. Looking at the pictures I haven't posted I decided on this one because, like Libby Sharwood of SAMREC says, "You can't help but to smile when you look at a penguin." 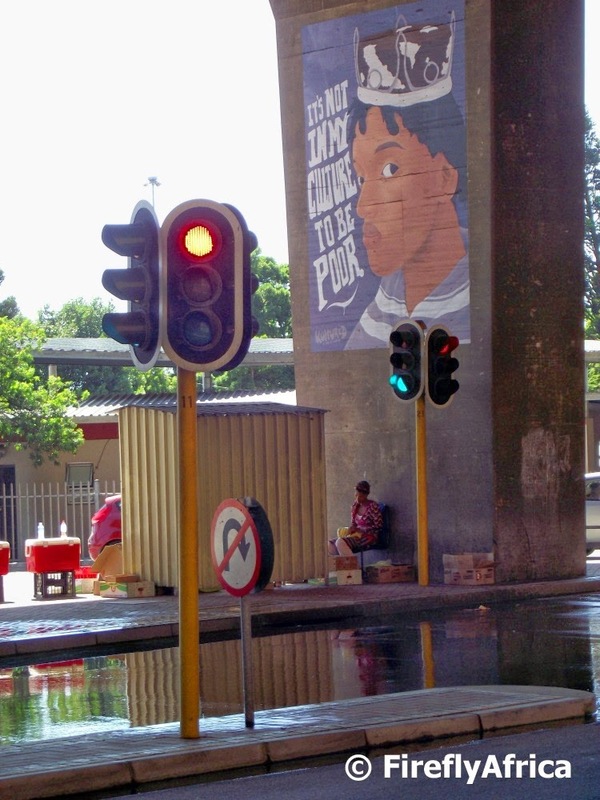 All along Route 67 visitors will find Way Finding Markers that contains different quotes by Nelson Mandela. 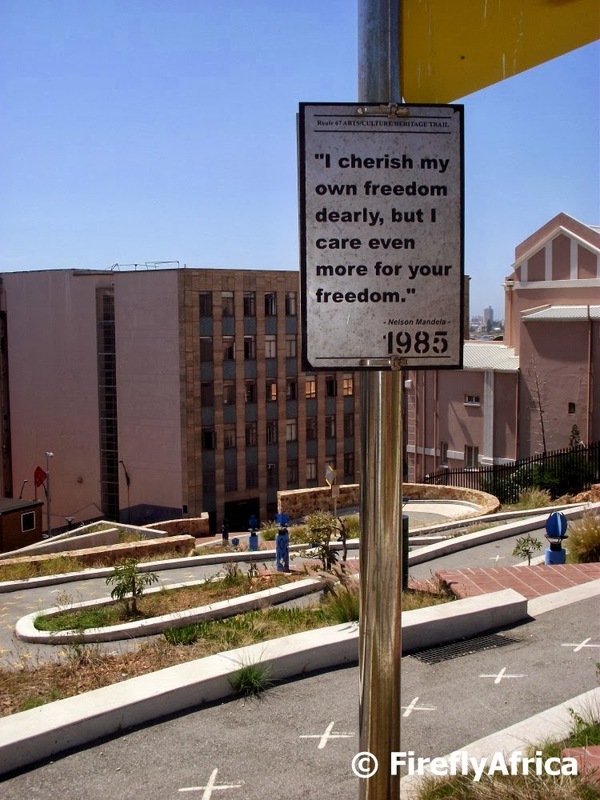 In this quote from 1985 Mandela says, "I cherish my own freedom dearly, but I care even more for your freedom." Food for thought. Some people see gardening as a form of art while others just try their best to keep the weeds out. Few people know that one of the 67 art pieces on Route 67 is a garden. 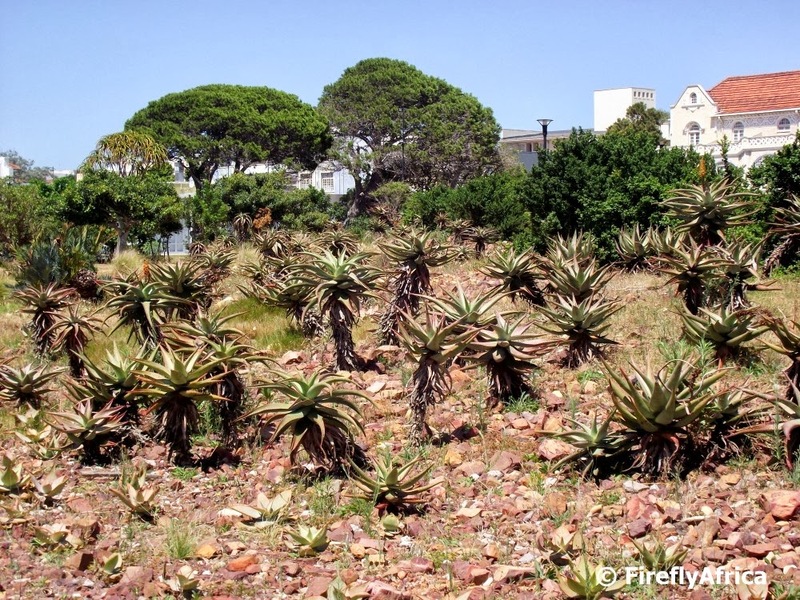 Not a pretty arty garden, but a garden of indigenous plants, mostly aloes, saved from sites being developed around Port Elizabeth. You often see chicken bones lying around in public. More than likely left overs from a KFC meal dropped while eating on the go. But what if you suddenly encounter a fish bone? One bigger than yourself? Well, then you either stumbled on what is left of a whale that washed up somewhere or you are standing on Market Square in Port Elizabeth. 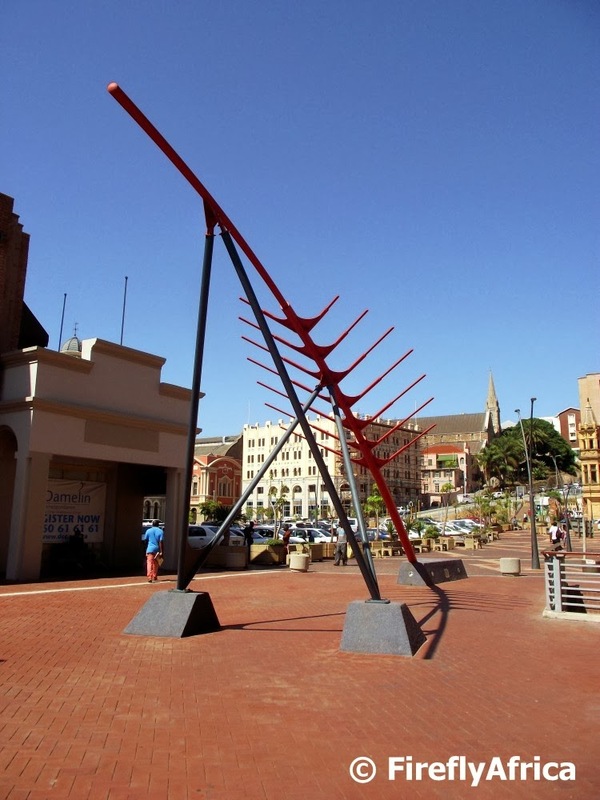 The Fishbone art piece by Imbono FJA Architects is an architectural element intended to visually anchor the old Jetty Street to Market Square (now called Vuyisile Mini Square). It encourages pedestrians to trace a historical route between the city and the harbor. 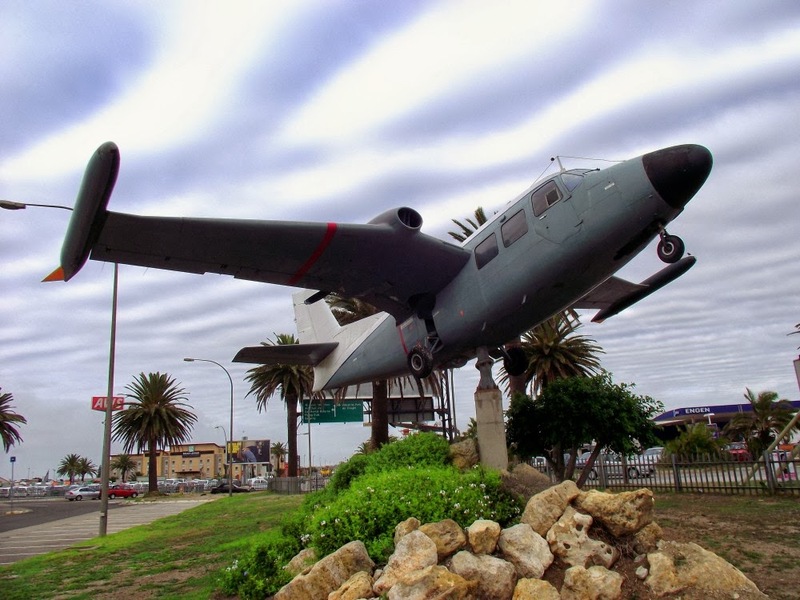 Every day a number of commercial and private planes take off and land at the Port Elizabeth Airport, but outside the airport there are two planes that just hang around, not going anywhere. The one is a Piaggio P.166, a twin-engine pusher-type utility aircraft developed by the Italian aircraft manufacturer Piaggio Aero. In the South African military the aircraft is known as the Albatross and was used by the South African Air force from 1969 to 1993. 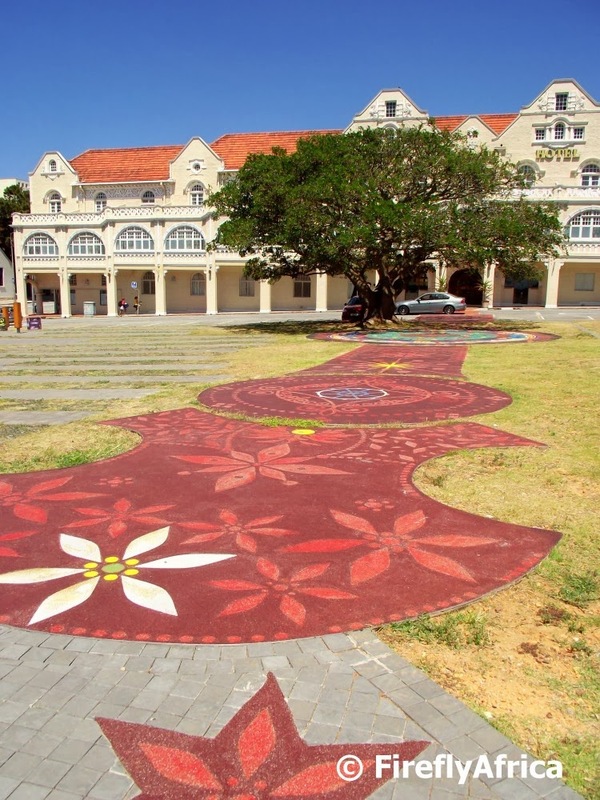 Starting on Belmont Terrace right in front of the (unfortunately closed) King Edward Hotel and leading onto the Donkin Reserve is the Welcome Carpet art piece. 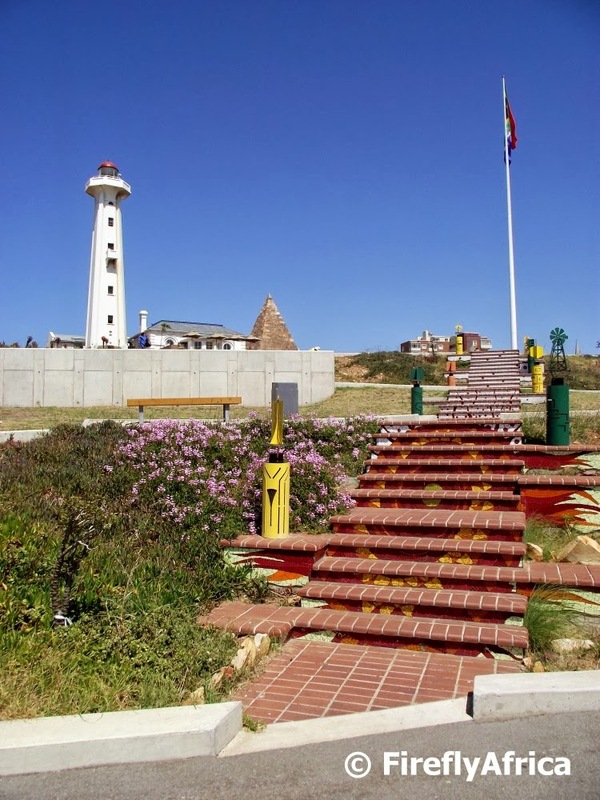 This Route 67 art piece by Lisbet Demeyer is a Quartz Carpet with inlaid bead artwork and acts as a welcoming celebration of the Eastern Cape's cultures, leading the diverse visitors to the Donkin Reserve onto the park. No 7 Castle Hill is a favorite spot for both young and old (and in between as well). I have been there so many times and always see something that I haven't seen before. It also helps that the museum has a passionate curator in Mrs Grizel Hart who really cares deeply for the museum and it's history. 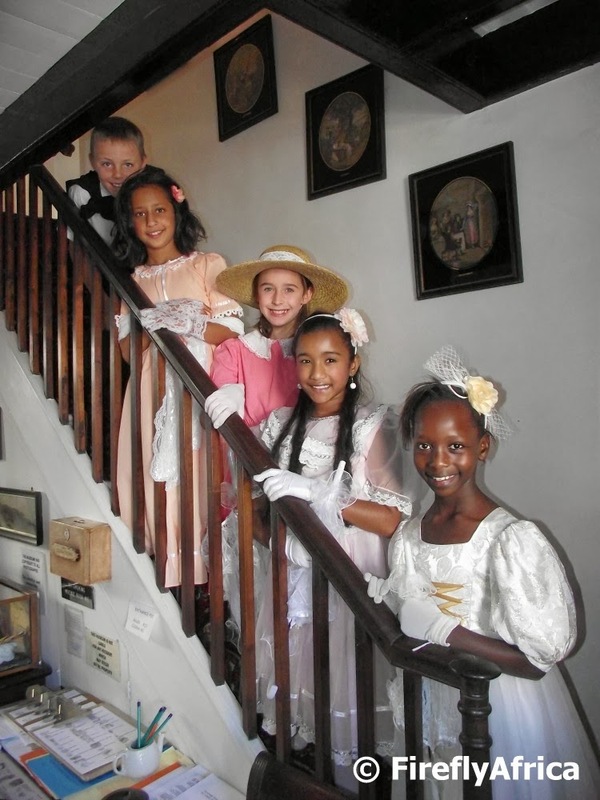 There is often not a day that passes without a school group coming through the museum but every now and then there is a group to be remembered. 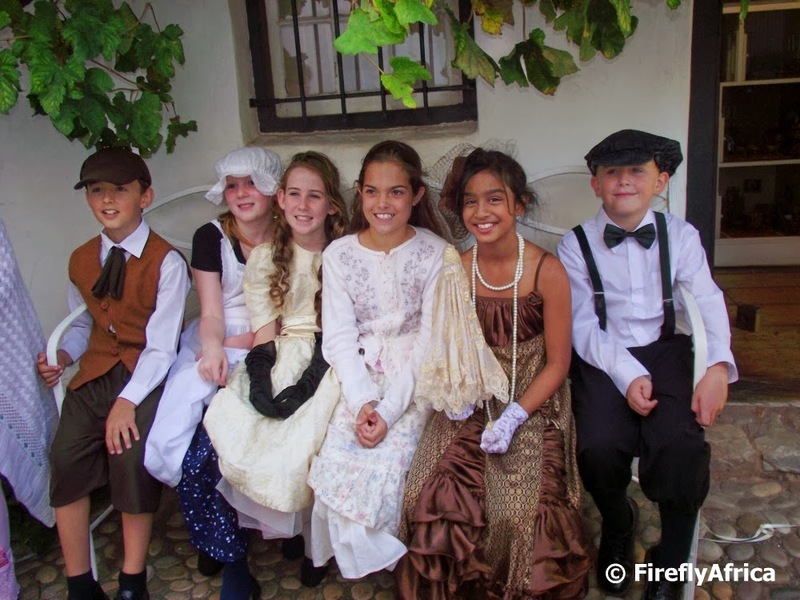 Every year the kids (I'm not sure but I think it's about grade 4 or 5) from St Georges Prep visits all dressed up in period clothing. Grizel dropped me a line a couple of days before their visit and I made sure I was there to snap a couple of pics of them. The Grand White Dinner has taken place in London, Paris, Berlin, Cape Town and now Port Elizabeth. 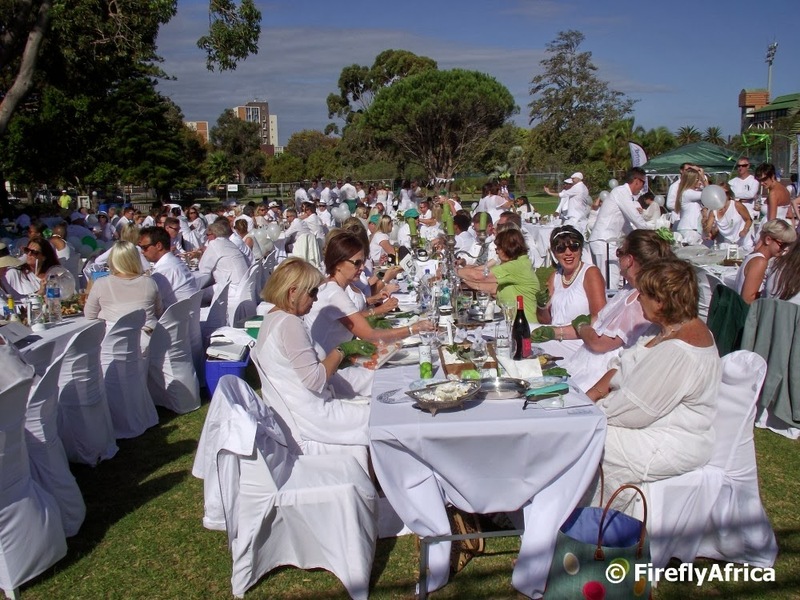 On Saturday afternoon I got to attend the first Grand White Dinner taking place in the Friendly City with compliments of the organisers of the event. I wasn't sure what to expect but was blown away from the moment we walked through the gate. Everything was laid out perfectly with somebody on hand right from the start to show guests where to go. 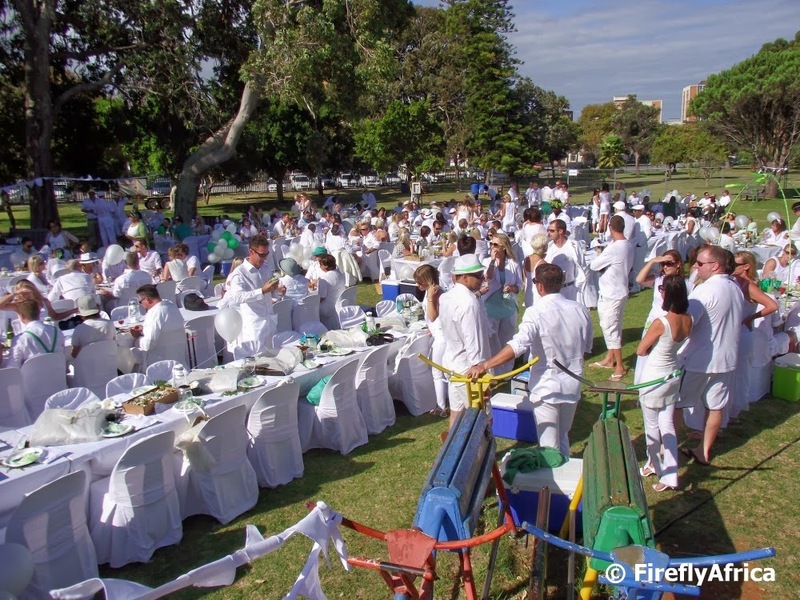 Best of all, people went all out to keep to the white with a touch of green theme. The only one that didn't play along was the weather with a coming cold front causing the notorious PE wind to come to the party as well. And thanks to that, mixed in with the flu that kept me in bed the whole of Sunday, we unfortunately ducked out before it got dark. From the photos on Facebook we missed out on some serious fun after dark. Guests didn't know where the event were going to take place and the fact that it was St Georges Park was only conveyed a couple of hours before it started. The venue was great with more than enough space for the party and parking available. I'm sure there are quite a few people who attended who is already looking to pencil in the date for next year's event into their diaries. I also got to meet Christine Visser who won tickets to attend the Grand White right here on Port Elizabeth Daily Photo. She's still going to send me a couple of photos that she took that I will post as soon as I get it from her. 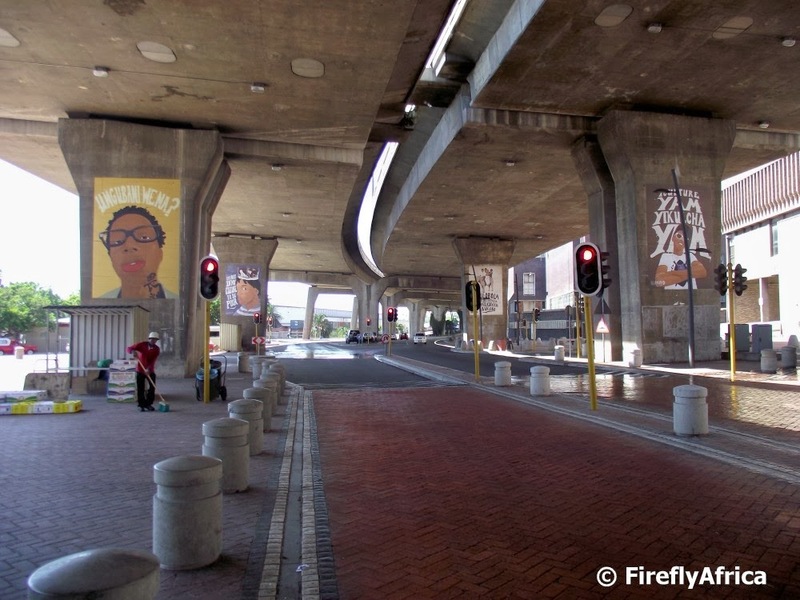 After yesterday's post of the bus station art, we are staying on Strand Street under the freeway. 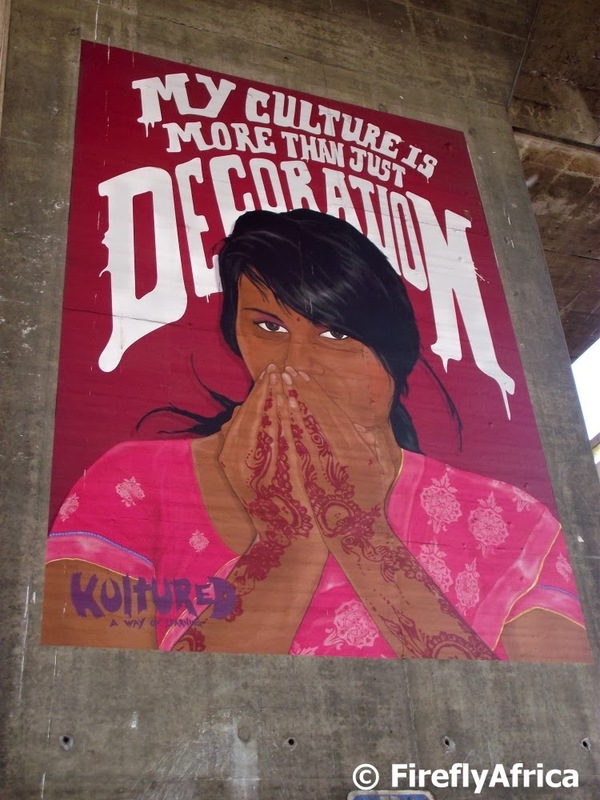 Ten art pieces called Identities by artist Lubhi Mtathi can be seen on the freeway pillars. The series are all powerful and evocative portraits that depict young South Africans from a range of cultural backgrounds dispelling racial and cultural stereotyping. 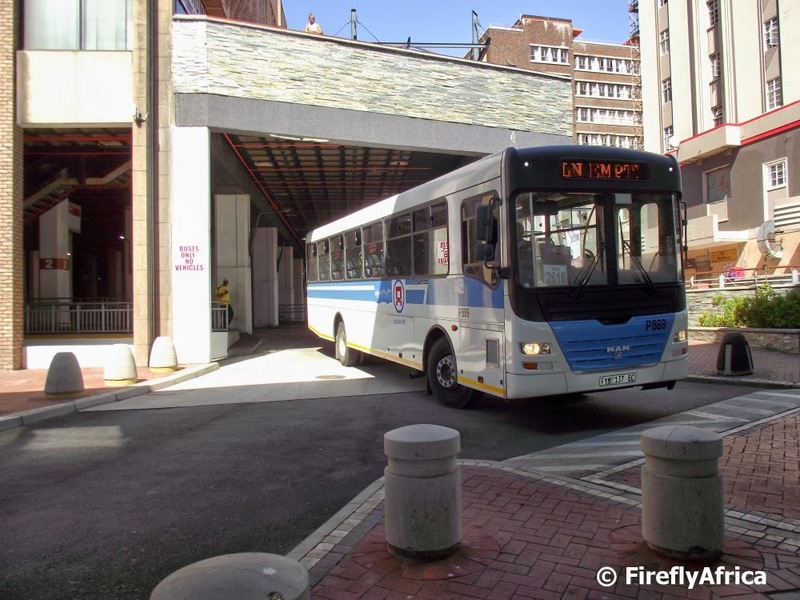 Everybody who has taken the bus into town and gotten on or off in the downtown bus station would remember how dark and dodgy it used to be. Since it's been opened up as part of the Strand Street and Route 67 redevelopments things have changed a bit and its a lot more open and lighter. 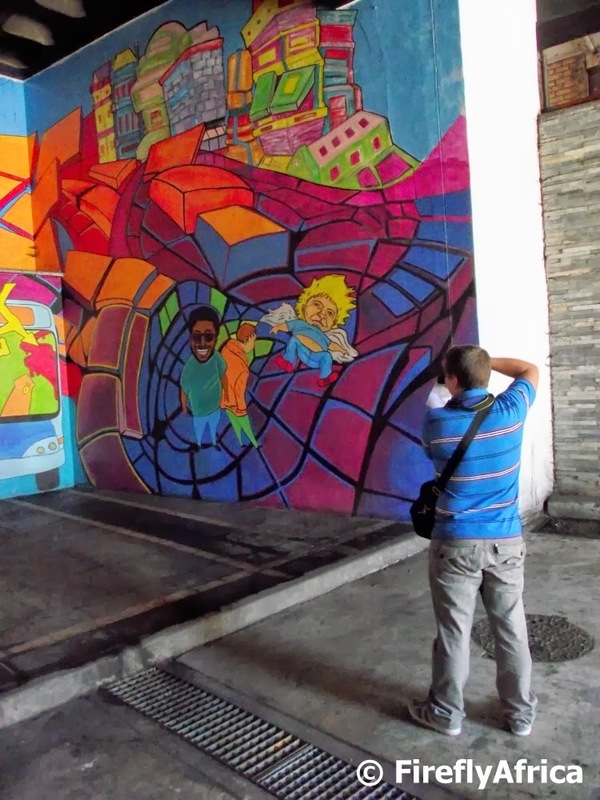 Adding even more colour and cheerfulness to the area is the Route 67 Bus Station Mural by 4BlindMice celebrating public transport and the daily journeys undertaken by the people of Port Elizabeth. There's even a figure in the painting that looks like Riaan Cruywagen. Wonder if it was on purpose. I took a late afternoon walk around the Kings Beach area a couple of weekends ago and just realized again how the development has enhanced the beachfront. The small lake really is a great addition to the area even though a lot of people are moaning about it, but it seems that some folk would always nitpick and look for something to complain about. 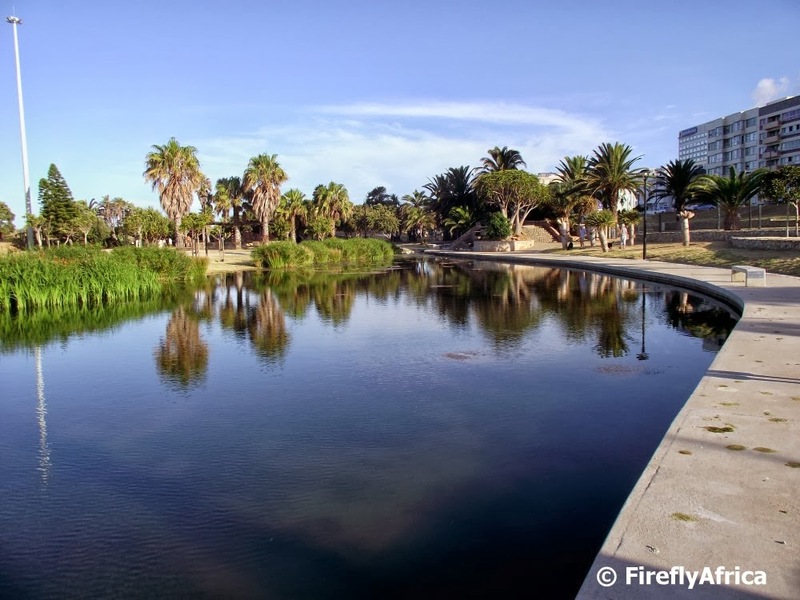 The lake however is having a couple of problems but the Mandela Bay Development Agency who is responsible for the development is looking into it. Route 67 has some very distinctive art pieces, some easily identified for what they are and others a little more abstract. At the bottom of the Donkin Reserve at the start of the winding Election Queue walkway stands the very abstract tower sculpture. 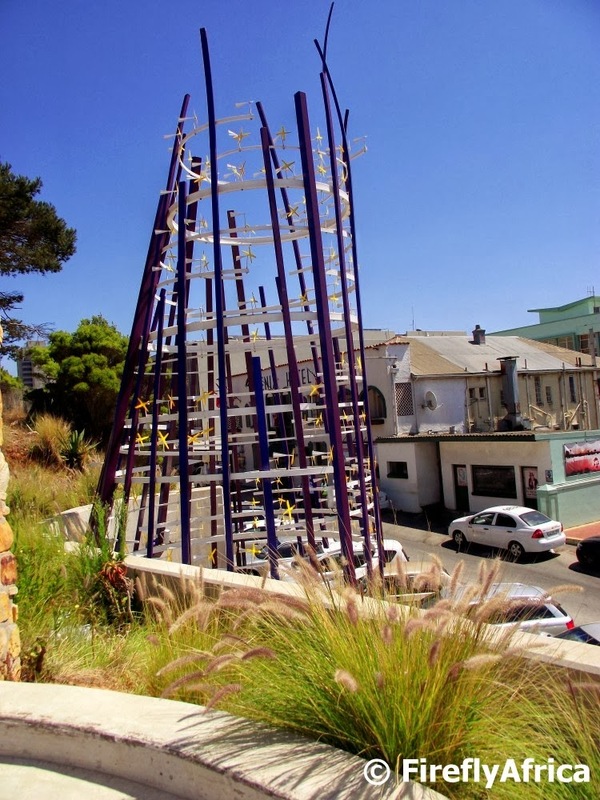 The Tower Sculpture acts as a beacon at the start of the journey onto the Donkin Reserve. The design allows for the tower to respond to the surrounding elements to allow wind and light to bring it to life. The historic Phoenix Hotel is visible just across the road from the sculpture. Is it a surf board? Is it a sail boat? Is it a seat? Well, its kind of a combination of the lot. 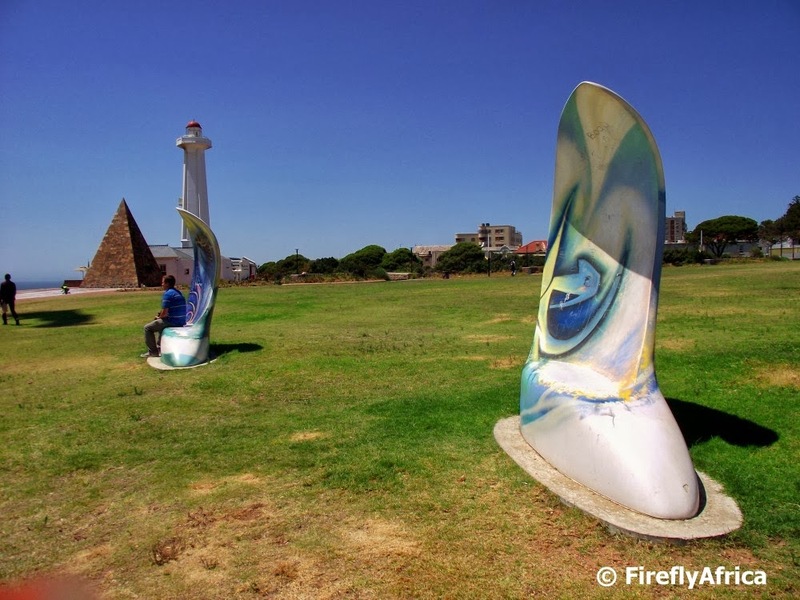 Windward is one (or rather three) of the art pieces forming part of Route 67 on the Donkin Reserve. The shape of the sculptured benches hint at Port Elizabeth's nautical history while the title refers to city's "Windy City" nickname. The seats are made to look like a combination of a surf board and a sail boat to carry over that message. Geocaching is fun with most caches hidden somewhere fairly easily eccessible. For a while now I've been eyeing Bird Rock on the beachfront thinking it could be a great site for an "extreme" terrain 5 cache and the other day I took a swim out there with fellow cachers Seekoei and erenei to place one with only three cachers swimming out there since to log it. 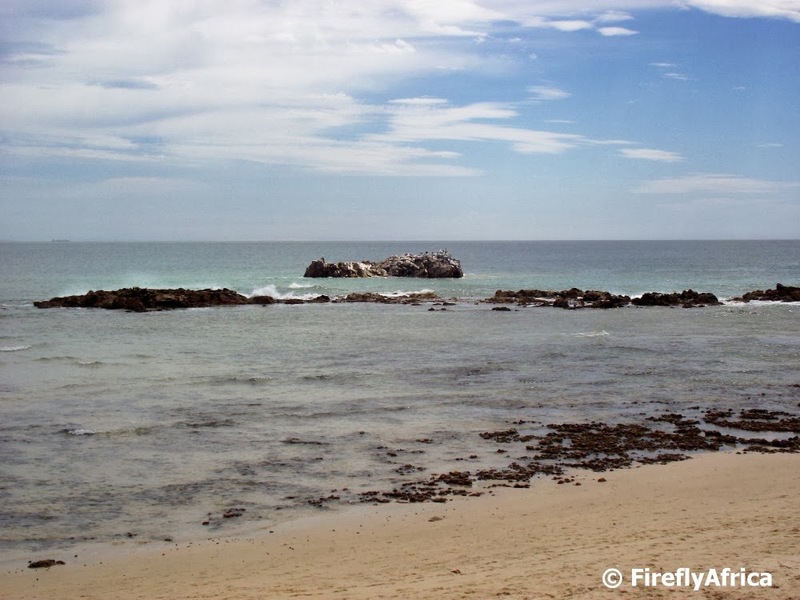 Bird Rock is situated between Hobie Beach and Pollok Beach and is always surrounded by water. 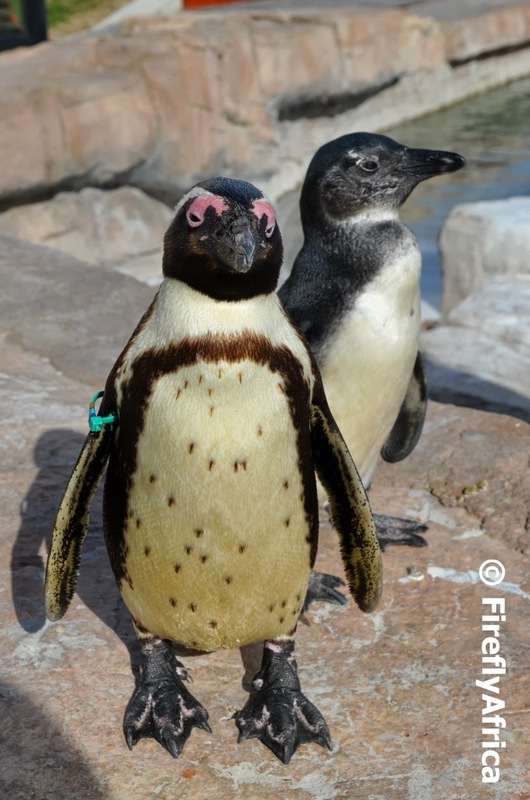 It got its name from the fact that there are always marine birds sitting on the rock, something you pick up quite quickly when you climb on the rock.